At the invitation of Foreign Secretary Teodoro Lopez Locsin of the Philippines, Foreign Minister Rimbink Pato of Papua New Guinea and Prime Minister and Foreign Minister Josaia Voreqe Bainimarama of Fiji, State Councilor and Foreign Minister Wang Yi will pay official visits to the Philippines, Papua New Guinea and Fiji from October 28 to 31. Now the China-Philippines relations continue to improve as evidenced by ever deepening political mutual trust and fruitful outcomes in across-the-board practical cooperation, which has delivered tangible benefits to the two peoples. In April this year, President Xi Jinping held his fifth meeting with President Rodrigo Duterte on the sidelines of the Boao Forum for Asia Annual Conference in China, during which they reached important consensus on further developing bilateral relations. The Philippines has taken over as the country coordinator for China-ASEAN Dialogue Relations. All these offer new development opportunities for China-Philippines relations in both bilateral and multilateral areas. State Councilor and Foreign Minister Wang Yi's visit to the Philippines will further implement the important consensus reached by the two heads of state, consolidate and deepen friendly cooperation and ensure closer communication and coordination in regional cooperation, so as to continuously move forward China-Philippines and China-ASEAN relations and East Asia cooperation. Papua New Guinea is a good friend and good partner of China in the Pacific Islands region. Over the past forty-two years since the establishment of diplomatic ties between China and Papua New Guinea, our bilateral relations have achieved remarkable progress. In November this year, Papua New Guinea will hold the APEC Economic Leaders' Meeting, which will provide an important opportunity for the further development of China-Papua New Guinea ties. China is willing to work with Papua New Guinea to maintain the momentum of high-level exchanges and interactions at other levels, deepen mutually beneficial cooperation in all dimensions, and enhance communication and coordination in international and regional affairs so as to move forward China-Papua New Guinea ties. In November 2014, President Xi Jinping paid a state visit to Fiji, during which the two sides agreed to establish the strategic partnership featuring mutual respect and common development. This has made our bilateral ties enter a new stage of rapid growth. In May 2017, Prime Minister Josaia Voreqe Bainimarama of Fiji traveled to China for the Belt and Road Forum for International Cooperation upon invitation as the only leader from the Pacific Islands region. China stands ready to work with Fiji to enhance dialogue and exchanges and deepen mutual trust and cooperation so as to move forward China-Fiji ties. Q: The Australian carried an article titled "Working Wisely With China Will Trump Any Veto" in which China is described as the largest trading partner of Australia, and cooperation with China is believed to be more beneficial to Australia's national interests than shutting China out. What is your comment? A: We have taken note of the relevant reports. We have also noted that recently the new Australian administration, including Prime Minister Morrison, has expressed that they would like to adopt positive policies towards China on many occasions. 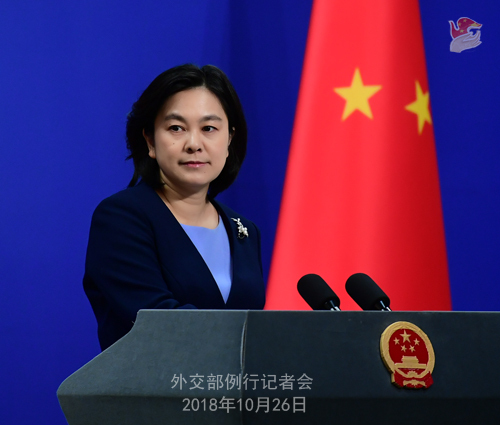 China always believes that the sound and steady development of China-Australia relations serves the common interests of the two countries and the two peoples. On the basis of mutual respect, equality and mutual benefit, China would like to work with Australia to deepen political mutual trust and expand trade and investment cooperation so that the development of China-Australia relations will be steered to better serve the two peoples. Q: It is reported that on October 25, the Ethiopian Parliament elected its first female President Sahle-Work Zewde. What is your comment? A: China congratulates Madam Sahle-Work Zewde on her election. Ethiopia is an important cooperation partner for China in Africa. In recent years, China-Ethiopia relations have been developing rapidly in an all-round way. The two sides have been strengthening political mutual trust and reaped fruitful outcomes from practical cooperation. China would like to work with Ethiopia to promote the in-depth growth of the China-Ethiopia Comprehensive Strategic Partnership for Cooperation. Q: According to reports, Chairman of the US Senate Judiciary Committee Charles Grassley recently published an article in the Journal of Politics, accusing China of severely violating the human rights of religious minorities and saying that fighting for religious freedom should be the core of US-China relations. What is your comment? A: Frankly speaking, when I saw the relevant report, I was shocked by and regretted the senator's sheer ignorance of and prejudice against China. 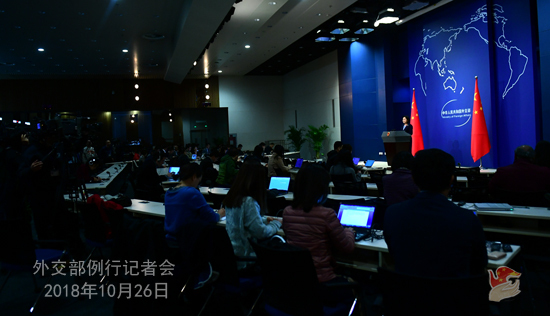 We are strongly dissatisfied with and firmly opposed to his groundless accusations against China. I am wondering how much the senator knows about China's ethnic groups and religions. Has he ever been to China? Does he know how many ethnic groups, religions, believers and places of worship in China? There are 56 ethnic groups in China. The 55 ethnic minorities have a population of 113.79 million. The main religions in China now include Buddhism, Taoism, Islamism, Catholicism and Christianity. China has nearly 200 million believers, more than 380,000 religious personnel, and over 140,000 places of worship registered for religious activities in accordance with the law. China fully protects the ethnic minorities' languages and characters and their right to education. About 40 laws, including the Constitution, have the provisions on the ethnic minorities' using and developing of their languages and characters. China's ethnic and religious policies have won the support of the people of all ethnic groups. It is an undeniable fact that the Chinese people of all ethnic groups are fully entitled to freedom of religion. I also want to ask this US senator how much he knows about the human rights conditions of the ethnic minorities in the US. According to the polls of Gallup and the Pew Research Center, 42% of the American people are extremely concerned about the ethnic relations in the US. 58% of the respondents believe that racism is a big issue facing the American society. 75% of the adult Muslims in the US said that people are prejudiced against the Muslims in the American society. One fourth of the African Americans and one tenth of the Latino Americans said that they are harassed because of their race or ethnicity. The ethnic minorities in the US are totally disadvantaged in terms of employment and salaries. The wealth gap between different ethnicities is getting wider and wider and the number of the crimes incited by racial hatred is on the rise. As an old Chinese saying goes, knowing someone is intelligence but knowing oneself is real wisdom. We hope that the relevant person in the US could view himself and other people in an objective and unbiased manner and make constructive efforts to promote the mutual understanding and mutual trust between the two peoples and enhance the friendship and cooperation between the two countries. Q: CCTV reporter Kong Linlin was charged for having conflict with a person at a UK political conference focused on political freedom in Hong Kong. Do you have any comment on this? A: The Spokesperson for the CCTV and the Spokesperson for the Chinese Embassy in the UK have made clear our position on this. First of all, I need to stress that the Hong Kong affairs belong to China's domestic affairs and allow no interference in any way by any foreign government, institution or individual. 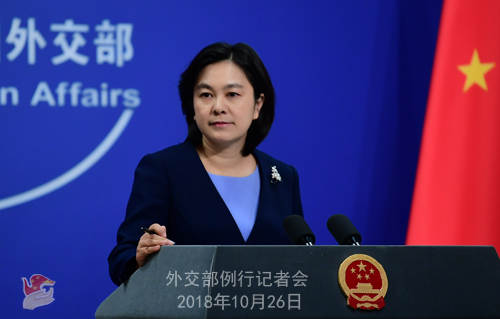 China strongly condemns and firmly opposes the relevant British organization and persons emboldening the forces to split China. It has been 21 years since Hong Kong returned to the motherland. Any attempt by anyone to turn back the clock of history is doomed to fail. We urge the British side to take concrete actions to ensure the sound development of China-UK relations. I want to point out that the Chinese reporter was exercising her legitimate right to express her opinions but was brutally obstructed and treated. Now she is wrongfully accused. China is gravely concerned about such wrongful accusation. The British police backpedalled on this case, the reason behind which is suspicious. We support the Chinese reporter in safeguarding her legitimate and lawful rights and interests through legal means. Q: It is reported that Adel Abdul-Mahdi was sworn in as Iraq's Prime Minister on October 24. Do you have any comment? A: China congratulates Mr. Abdul-Mahdi on his election. We believe that the new Iraqi government will achieve new progress in developing its national economy and speeding up reconstruction and realize the long-term stability for its country at an early date. Q: Pakistani Foreign Ministry announced that Prime Minister Imran Khan will visit China on November 2. What are China's expectations for this visit? A: China has invited Prime Minister Imran Khan to pay an official visit to China in early November and attend the First China International Import Expo. We will officially release the relevant information in due course. China and Pakistan are all-weather strategic cooperative partners. Our bilateral relations have been operating at a high level. After his election, Prime Minister Imran Khan has stressed that Pakistan's relationship with China will continue to be a cornerstone of Pakistan's foreign policies and Pakistan will steadfastly advance the CPEC projects. The Chinese side commends these remarks. Shortly after the new Pakistani government was established, State Councilor and Foreign Minister Wang Yi paid a visit to Pakistan. He compared notes with the Pakistani leaders on bilateral relations and all-around cooperation, and extensive consensus was reached. We would like to work with Pakistan to forge China-Pakistan relations into an example of good neighborliness and friendship, a pillar for regional peace and stability and a benchmark for the Belt and Road cooperation. We look forward to working with Pakistan to ensure Prime Minister Imran Khan's visit a full success and move forward China-Pakistan relations. Q: I want to ask for comments on the BBC report on Xinjiang earlier this week. The satellite images show that a detention center outside of Urumchi doubled in size over the past year. Can you tell us why China needs to expand the size of detention center so quickly in Xinjiang? A: With regard to Xinjiang's efforts to fight terrorism, maintain stability and set up vocational education and training institutions, not long ago Chairman of the Xinjiang Uygur Autonomous Region Shohrat Zakir gave an interview to the Chinese media and elaborated on the relevant situation. First of all, I would like to correct your mistake. They are not detention centers but vocational education and training institutions, which aim to eliminate extremism and prevent terrorism at the budding stage. Actually many countries around the world are also trying to do so. A lot of countries have been actively exploring the pathways to fight terrorism and extremism in light of their actual conditions. A couple of days ago, I elaborated on the relevant situation on this podium. For instance, the counter-terrorism strategy announced by the British government in June this year stressed the early intervention on the people affected by extremism. In 2016, France announced that it would set up de-extremism centers in its 12 provinces to help its citizens affected by extremism return to normal life. The United States is also trying to remold the youngsters affected by extremism with community corrections. The relevant practices in China are no different from those in the UK, France and the US. They all aim to nip the evil in the bud, cure the "sickness" and save people, and make utmost efforts to protect people's basic human rights from being harmed by terrorism and extremism. While taking measures to prevent and crack down on violent terrorist crimes in accordance with the law, the Chinese government is also taking some precautionary measures, including setting up vocational education and training institutions in accordance with law in Xinjiang, to help the people who are at the early stage of being affected by extremism and those who committed petty crimes to return to normal life in the society at an early date. Combating terrorism and extremism is a thorny issue facing all countries around the world. All countries in the world should adopt uniform standards instead of double standards with regard to taking precautionary measures to fight terrorism and extremism. We hope that all relevant parties can step up exchanges on counter-terrorism and de-extremism and understand the measures taken by other countries to safeguard social order and stability. Q: Both the BBC and the AFP issued Xinjiang-related reports, which mentioned the reeducation programs there. We have also noted that there have been quite a few reports from the Chinese media. The Global Times and the CCTV had interviews with Xinjiang officials. Would China be able to help arrange interviews for the foreign media or a press briefing with Xinjiang officials? A: Like I said just now, the Chairman of the Xinjiang Uygur Autonomous Region has elaborated on the relevant situation. Xinjiang is an open region, so visiting Xinjiang has no problem. Over 100 million visits have been made to Xinjiang either over the past one year or in the first nine months of this year. If you want to learn about the specific situation, you can contact the local government. If you can report Xinjiang with goodwill and in an objective and unbiased way, you are welcome to go there. However, if you travel to Xinjiang with prejudice or even with malice, you are certainly not welcome to go there. In a nutshell, we hope that the media should refrain from listening to the one-sided story and base their reports on the facts. Follow-up: Will the Foreign Ministry be willing to help arrange a press conference, maybe in Beijing, for foreign journalists on Xinjiang? A: The Foreign Ministry is in charge of foreign affairs. Some foreign media are interested in China's domestic situations, for example, the situation in Xinjiang. When you raise relevant questions at the Foreign Ministry's regular press conference, we will do our best to answer them. But if you want to learn about more details, you can contact the local government or the competent Chinese authorities. Q: A follow-up question on Prime Minister Imran Khan's visit to China. According to reports, he has recently expressed aversion to go for IMF loans. And in his recent visit to Saudi Arabia, he secured about 6 billion dollars of funding. Will China consider extending more financial support to Pakistan? A: The Chinese side has noted that Pakistan has met some financial difficulties. We support Pakistan in taking effective measures to address them. In fact, we have offered assistance to the Pakistani side to the best of our ability. We believe that the Pakistani government is able to overcome the temporary difficulties and ensure the sound and steady development of its economy. Q: Can you offer some details on the ongoing visit of Japanese Prime Minister Shinzo Abe, for example, his talks with the Chinese leadership. Reports say that Japan is backing China's Belt and Road Initiative and the two countries are going to jointly take up some projects in other countries. A: Prime Minister Shinzo Abe is now visiting China. This morning, Chairman of the NPC Standing Committee Li Zhanshu met with Prime Minister Shinzo Abe and Premier Li Keqiang held talks with him. This afternoon, President Xi Jinping will meet with him. We will release the relevant information in a timely manner. China and Japan are each other's important neighbor. The sound and steady development of China-Japan relations serves the fundamental interests of the two countries and two peoples. On the basis of the four China-Japan political documents and in the spirit of taking history as a mirror and facing forward to the future, China would like to work with Japan to strive for new progress after returning bilateral relations to the right track. We would like to strengthen bilateral dialogues in the political, economic and other fields, enhance policy communication and coordination, step up cooperation in scientific and technological innovation, energy conservation and environmental protection, health care and old-age care, fiscal and financial sectors, disaster prevention and agriculture. The two sides will work together to build the third markets cooperation into a new pillar of bilateral practical cooperation. Against the backdrop of the current international situations, China and Japan, as two major economies, should jointly uphold multilateralism and free trade and build an open world economy. In his talks with Premier Li Keqiang, Prime Minister Shinzo Abe said that Japan and China are each other's important neighbor and strategic partner. We pose no threats to each other. China's development presents important opportunities to Japan. On the basis of the four Japan-China political documents, Japan stands ready to enhance strategic communication with China and deepen cooperation and interactions in economy and trade, investment, finance, innovation, third markets, teenage exchanges, sports and sub-national exchanges. The two sides should work together to strive for substantive progress out of the Regional Comprehensive Economic Partnership (RCEP) negotiations and contribute to establishing a free and just international economic order, upholding free trade, and promoting global growth. This morning, after their talks, the two prime ministers also witnessed the signing of more than ten inter-governmental cooperation agreements in the fields of politics, innovation, finance, customs and sports. We will release more information when we have it. Follow-up: Is the third markets cooperation about the Belt and Road Initiative? A: The Japanese side has expressed its wish to actively participate in the Belt and Road Initiative before and said that it is willing to work with China to actively explore the third markets cooperation for win-win outcomes. Thanks to the concerted efforts of the two sides, the third markets cooperation has become a new growth point for China-Japan economic and trade relations under the new circumstances, which has opened up a new path for bilateral practical cooperation.